In this project, we began by learning all about chicks. We were shown a PowerPoint presentation or a Google Slide that was filled with information about different breeds of chicks, handling chicks, feeding them, chick diseases and more. By the end of the presentation, we were mini-experts. Now, the main point of this project was to foster chicks for about 8 weeks (2 months) for the EBI chicken coop, which was still in progress. Each participant would be caring for 3-4 chicks by the end of the project. 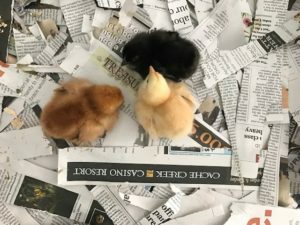 The family that raised the most friendly and social chicks would get to send theirs to the EBI chicken coop, and the rest of them would go to a family-owned farm in Petaluma (Somar Farms). A couple of families would even be keeping their chicks and watch them grow into full-grown hens. (There would be no roosters.) So we needed to know how to care for chicks and what materials would be required to do so. After that, there were many steps to complete this project. First, a few families went to Home Depot to retrieve bins and chicken wire for the building of their habitats. A bit later, the families rendezvoused to build the habitats. We used screwdrivers and rulers to measure the chicken wire and cut holes in the big plastic bins to put the chicken wire on top. Then, we added small sticks that stretched across the width of the bin so the chicks could practice perching. After building what would soon be their homes for 8 weeks, we brought the bins home. Then, the day we had all been waiting for finally came, near the end of March. This was the day that we would meet our chicks. We all gathered at BioFuel Oasis and got oriented, and then each child participant chose their chicks according to the breeds that their caretakers had chosen. 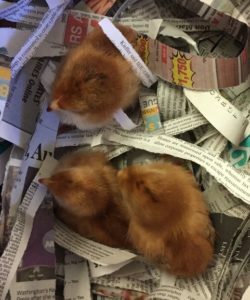 We brought home our chicks and filled the bottoms of their bins with newspaper so they could be cared for for the next 2 months. After that process was over, the chicks that would be permanently living at EBI were chosen, and everyone went to Petaluma to see the farm, and the families that were leaving their chicks there brought them over. That pretty much summarizes the 2017 chick project.